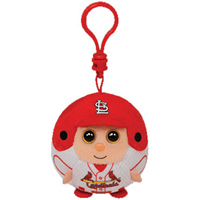 Send a cute and cuddly St. Louis Cardinals Beanie Ballz to a special baseball fan. Beanie Ballz are manufactured by Ty, well-known for their popular Beanie Babies toys. Ty continues their tradition of high quality toys with their new officially licensed MLB Beanie Ballz collection . You'll appreciate the attention to detail found on the baseball jersey and cap printed on the St. Louis Cardinals Beanie Ballz. 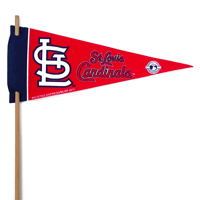 All official Cardinals team logos are printed to replicate the real jerseys and caps worn by the big leaguers. 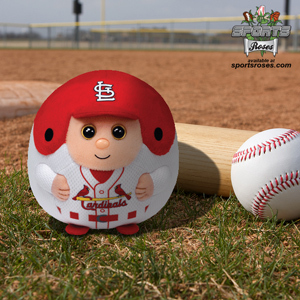 These adorable stuffed toys are guaranteed to bring a smile to any Cardinals fan. Giving as a gift? 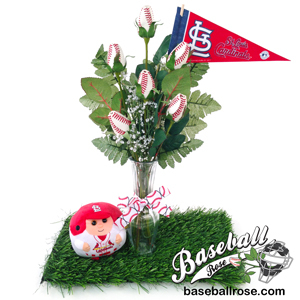 Create a memorable gift by accessorizing the St. Louis Cardinals Beanie Ballz with the Baseball Rose products and other accessories listed below. Send an memorable gift to someone special that loves baseball. 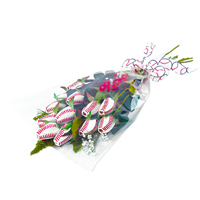 Baseball Roses arranged in an elegant vase arrangement. A miniature version of the Beanie Ballz that can be clipped onto a purse/bag or used as a holiday ornament.